Pure Dentistry Provides Denture Services in Brisbane South-Side. You can view available dentists and book an appointment online 24/7 on Pure Dentistry website or call our receptionist on (07) 3343 4869. Dentures can be used to maintain facial form and masticatory functions. Dentures are generally economical and if you have no teeth, with a denture chewing should become easier and your facial appearance normally improves. You may find below article helpful in providing you with some basic information about dentures. To see if dentures are suitable for your conditions you should consult with a qualified dentist. Modern partial dentures are very comfortable and look similar to natural teeth. Many people mistake Partials with real teeth. In addition to being similar to natural teeth, Partial Dentures help and support other natural teeth because they prevent other teeth from shifting and act as added support that otherwise would have been lost due to the missing teeth. Complete Dentures are also known as Full Dentures. They are fabricated to replace all missing teeth and sometimes the underlying bone in a dental arch. On the other hand, Partial Dentures are used when the patient still has some teeth. So, Partial Dentures are either supported by teeth or supported both by teeth and by other tissues. In other words, some Partial Dentures get their stability and retention both from the surrounding teeth and also from other structures. Because Partial Dentures can be anchored to existing teeth (natural or implant), they can be expected to have better retention and stability compared to Complete Dentures. A Denture is a removable replacement for lost teeth and their surrounding tissues. Dentures can be either a complete denture for when all teeth are missing or they can be a partial denture for when a few teeth are missing. 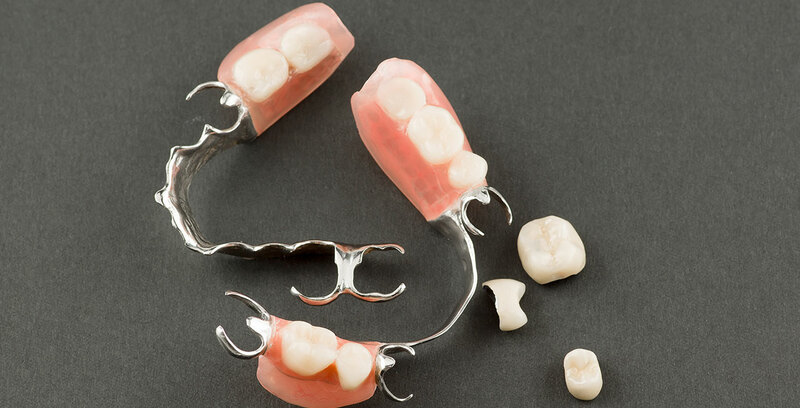 Partial Dentures are sometimes called Removable Bridges. Some dentists may also refer to dental bridges as fixed partial dentures. Most Complete Dentures are made of a pink acrylic plastic base. The base is fabricated in the same colour as gum tissue. The base of the denture supports a set of plastic or porcelain teeth. Partial dentures are made of a base into which artificial teeth are inserted. Partials are custom made by the lab from models of your mouth. Partial dentures are usually made of cobalt-chromium alloy or acrylic plastic. Cobalt-chrome is an allow with a very high specific strength. This alloy is also commonly used in dental implants for its high wear and cyclic fatigue resistance. Partial dentures made of Acrylic Plastic are normally used as an interim replacement for missing teeth. 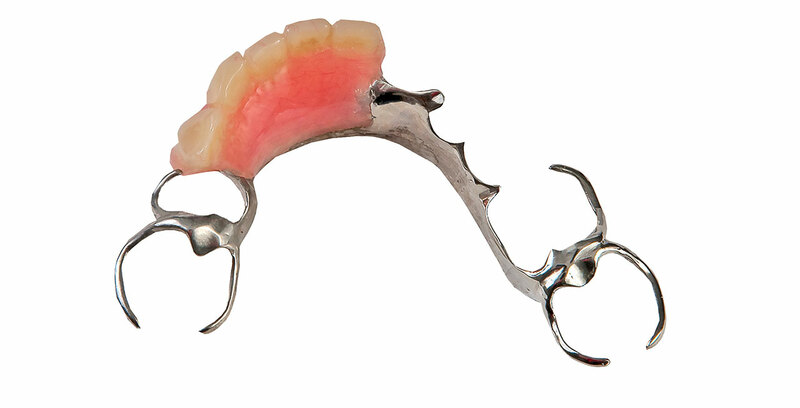 Permanent Partial Dentures are usually made of a combination of metal and acrylic plastic. Immediate Dentures, as the name implies, are fabricated for insertion immediately after extraction of the remaining teeth. With an immediate denture, extraction wounds are not foregone through the healing period. The main benefit of Immediate Dentures is the maintenance of the appearance of the patient. With Immediate Dentures, there is no tooth-less-ness period. They are great aesthetic solutions, however, the fit of an immediate denture may change in 3 to 6 months and they normally require maintenance or replacement. The change in the fit is almost inevitable because unless an implant is fitted, after extraction the bone that used to support the tooth starts to shrink. Immediate Dentures may not be suitable for people with certain medical conditions. You can consult with your dentist to see if they are suitable for you. Teeth extraction is a traumatic dental procedure and it can take up to several weeks for the teeth sockets to heal. When the healing period is over, (about 12 weeks), then a conventional denture can be fitted into the mouth. This means that with conventional dentures, there is a waiting period for the gum to completely heal and during this period the patient has no teeth. To address this concern and maintain the appearance of the patient face and smile, an Immediate Denture may be used during this period. Interim immediate dentures (IID) are inserted immediately after the extraction. As the name implies, Interim Immediate Dentures are designed and constructed to be used for a limited time. They are designed to be worn only during the healing period of the surgical wound and then replaced with long-term artificial teeth. Interim Immediate Dentures are also referred to as Transitional Immediate Dentures. 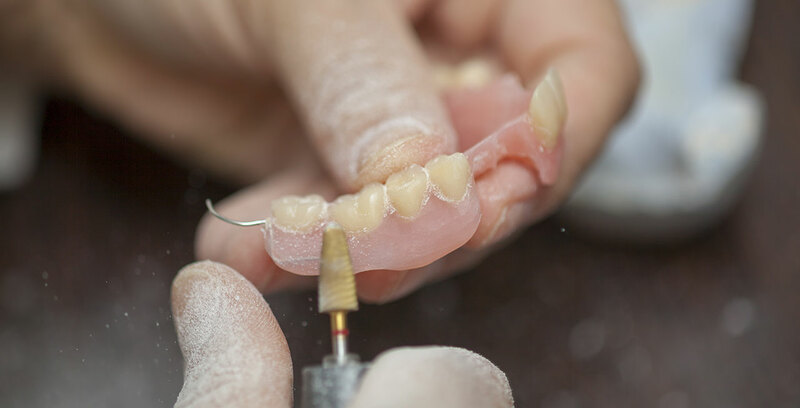 Interim Immediate Dentures are used when the front and back teeth are remaining until the extraction day. They are fitted to patient mouth on the same day as the extraction. 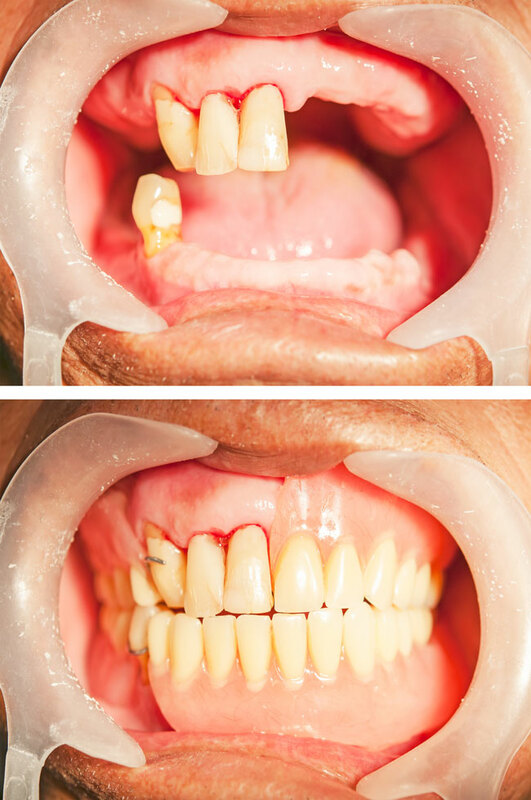 For some patients, the main purpose of an interim immediate denture is aesthetics. With Interim Immediate Dentures, the patient is not without tooth (teeth) until a definitive solution is fitted. Conventional Immediate Dentures (CID) are used when the front teeth are remaining or when the patient decides to go ahead with the extraction of the back teeth prior to extraction of the front teeth. When healing has occurred and completed after the removal of all of the posterior (back) teeth, a conventional immediate denture procedure can start. Conventional Immediate Dentures are also known as Classic Immediate Dentures. An immediate complete denture is a complete denture that has been constructed in advance. It will be inserted immediately after the extraction of all remaining teeth. An immediate complete denture is removable and as the name suggests, with an immediate denture, the waiting period between tooth extraction and denture delivery is removed. The patient will not be without teeth even for one single day for this reason, immediate complete dentures are great solutions when aesthetics is a concern. With these dentures, the patient does not have to wait and be without teeth until gum tissues are healed. The person wearing immediate complete dentures, may be able to go back to work as usual. Your dentist may also instruct you to avoid removal of your immediate denture for the first 24 hours. Failure to follow this instruction may cause swelling and may disturb re-insertion of the denture for a couple of days. Your dentist may ask you to make an appointment after 24 hours to remove the denture for further inspection and adjustment. Immediate dentures are great solutions to minimise the negative impacts of losing teeth. They can restore the dental appearance and minimise mastication and speech problems and therefore help with the mental well-being of the patients as well. Immediate dentures can also facilitate patients’ adoption to dentures. Patients who have been toothless for a couple of months adopt to new denture with difficulty whereas people who have had an interim immediate denture, usually adopt quicker and easier. Your dentist may ask you to continue wearing your denture during the night for about a week. You may be asked to remove your denture after food consumption and before bedtime to clean both the denture and your mouth. In Some cases, an immediate denture can be used as a protective compress and bandage to control bleeding from a surgically-traumatised area. They may help with the healing of an extraction-related surgical wound. They can also minimise post-extraction pain because the socket will be protected. With immediate dentures, the wearer does not have to be tooth-less while the tooth sockets and gum are healing. Your dentist can advise if immediate dentures are useful after extraction or not because in some cases an immediate denture may not be sensible and it may compromise the healing process of the extraction socket. Dentures should be washed under the running water and outside the mouth. Oral cavity should be rinsed separately. Dentures appliances are fragile, especially acrylic dentures. To prevent damage, always wash your dentures over a bowl of water or place a protective cloth underneath it in case it is dropped. Acrylic dentures are sensitive to hot temperatures and may be damaged when washed under hot water. 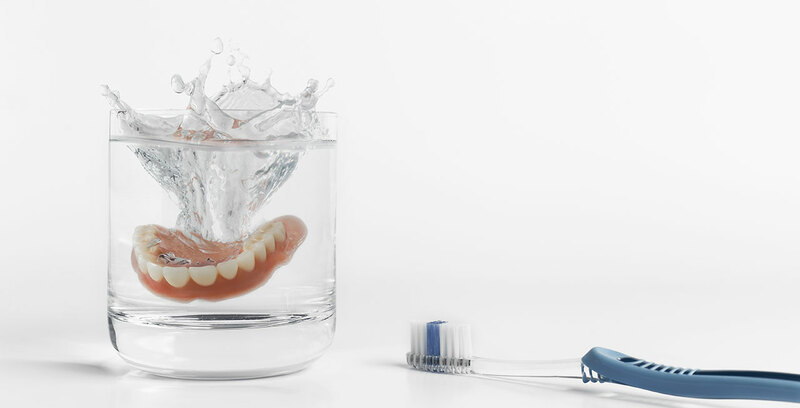 You can wash your dentures with warm water but do not wash acrylic dentures under hot water. Modern Dentures are durable and usually they can be expected to last three to 5 years. but they still need adjustment and maintenance every now and then. To make the denture fit more comfortable, your dentist may adjust your dentures over a period of weeks. Overtime, due to changes that occur in the mouth tissues, you may need to replace your denture. Removable dentures should be taken out every night (or day) for cleaning. Place your denture in denture cleaning liquid or water before sleep and in the morning, before inserting your denture, brush your gum, palate and tongue with a soft-bristled brush. Dirty dentures can cause bad breath, gum irritation or stains. Brush your denture thoroughly on all surfaces at least once a day. After 7 days or so, your dentist may ask you to remove your denture prior to bedtime and leave it out during the night. You may need to make follow up appointments for treatment of sore spots, etc. Your dentist can advise the frequency of maintenance appointments. To prevent dimensional change, dentures should be kept most when they are outside your mouth. If you are using a denture-soaking solution, wash your denture before inserting it into your mouth. The soaking solution may contain chemicals that can cause pain, vomiting or irritation when swallowed. Some modern material used in dentures, do NOT need to be kept moist. Ask your dentist if this is a requirement for your denture. Even the most modern artificial teeth technology cannot provide the complete functions of a natural tooth. Natural teeth are very precious and you should take a good care of them by good oral hygiene, regular visits to the dentist and also use mouth guards when it is recommended. Make an appointment with your dentist as soon as the denture is becoming loose. Loose denture can lead to discomfort and sores. Your dentist can make required adjustments and check if the oral tissues are healthy. Well-fitting dentures do not need denture adhesives. However, because the underlying bone starts to shrink, adhesives may be required to fill the spaces for a better stability and retention. If you are a first-time user of the denture and you are trying to learn how to eat with dentures, it is best to avoid sticky food. eat soft food and in start small pieces. For some people, it can take up to several months to learn to chew with dentures. Dentures are not suitable treatment for everyone. Many factors including but not limited to your periodontal status, caries rate and current degree of your edentulism (tooth-less-ness) will be considered by your dentist. You need to consult with a qualified dentist to see if you are a suitable candidate for this treatment. For some people, gum sores may develop due to stability problems. Gum sores make it hard for the person to wear the denture appliance. It may also take some time for oral muscles to adjust to your new denture and your speech may be affected for a while until your muscles develop the new habits. With dentures, you should not expect the same chewing efficiency as natural teeth. You can expect ¼ of the efficiency of natural teeth and also in general, fixed artificial teeth (e.g. Implants) have better chewing efficiency compared to removable artificial teeth (Dentures). In general, the amount of required maintenance on the dentures may be a bit high. They do require daily care and occasionally maintenance in dental office or dental lab. However, when dentist instructions are followed correctly and the denture is maintained properly, despite the extra effort required, they usually provide satisfying results for many patients who have lost their teeth.